NORM: Anyway, Ahmed, what do you do in your spare time? Got any hobbies, play any sport? AHMED: No I don't really have time for that sort of thing. NORM: No time for sport?? 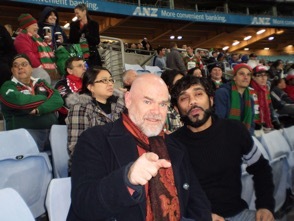 During the show's rehearsal period, Laurence Coy (Norm) took time out to rectify this situation by taking Craig Meneaud (Ahmed) to the footy and pointing out some of the finer points of the game. Pakistani TV producer/presenter Zahid Minhas from Dosti TV visited rehearsals today to interview myself and actors Laurence Coy and Craig Meneaud about the upcoming season of Norm and Ahmed. I'm fairly sure this is the first time in the work's 40 year history that the Pakistani media have been involved in a production of the play and it felt like everything old was new again. Another layer of the play had been unlocked. After Zahid interviewed us, the tables were turned as we listened to Life According to Zahid. Captivating and highly entertaining! Click on this PODCAST to listen to Chris Fung, one of the University of Sydney's Department of Performance Studies students observing rehearsals of Norm and Ahmed plus Shafana and Aunt Sarrinah speaking about what he's gained from watching professionals create live theatre. Today we were privileged to have Makiz Ansari from Affinity Intercultural Foundation and her cousin Tamkin Ansari visit the rehearsals of Shafana and Aunt Sarrinah. Afghani/Australian Makiz was a major source of inspiration for playwright Alana Valentine and her character of 'Shafana' takes much from Makiz's eloquently told story. The entire creative team were able to ask Makiz questions about her faith, her cultural heritage and her experience of life in Australia as a Muslim woman. Makiz joked she was having a 'bad hijab day' but she was able to give actor Sheridan Harbridge a valuable tutorial in wearing the headscarf. I visited the first rehearsal of Shafana and Aunt Sarrinah yesterday which is in excellent, spine-tingling shape. Alana Valentine has steadily and masterfully filtered feedback received over the last 6 months and crafted the play into something markedly different to the draft I first read in January. 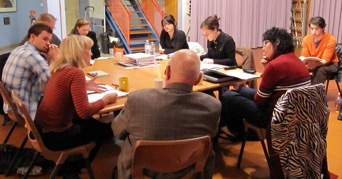 Clockwise from the checked shirt: Daniel Hunter (SM), Aarne Neeme (Director), Deirdre Burges (Designer), Sheridan Harbridge (Shafana), Camilla Ah Kin (Aunt Sarrinah), Alana Valentine (Playwright), Tony Youlden (Lighting) and May-Brit Akerholt (Dramaturg). In the background: one of the numerous University of Sydney Department of Performance Studies' students studying the rehearsal process. This week, a Sydney high school whose English department had booked out an entire performance of Norm and Ahmed + Shafana and Aunt Sarrinah, were forced by their principal to cancel the booking. The reason? That pesky old "f" word uttered by Norm. It appears the more things change, the more they stay the same. 40 years ago, that one word put the play at the centre of a censorship battle which saw it banned in three states, but also gave Australian theatre its front page debut. Buzo was bemused and perhaps a little annoyed. While the publicity achieved instant fame for the play and its author, he felt its important themes were somewhat overshadowed by the brouhaha over one word. The most distressing part about this school principal's fearful, archaic attitude is that it shows a complete lack of understanding about the purpose of dramatic art, which is to ask questions, encourage self reflection and open minds. Does banning students from seeing a production about the tension between cultures and generations in Australia help them become good citizens and critical thinkers? I think not. Here's a very short bite from an ABC TV 'Talking Heads' episode on Graeme Blundell who produced Norm and Ahmed in 1970 with some great footage of the play being done for a magistrate and his court. Welcome! Emma Buzo, founder and director of The Alex Buzo Company here. After two years I've decided to spill the beans. On running an independent arts organisation, that is. First up, I'll be documenting the process of theatre making. Rehearsals are about to begin for the company's upcoming production of Norm and Ahmed + Shafana and Aunt Sarrinah at the Seymour Centre 5-29 August. Those studying and teaching theatre as well as those interested in the arts and how an idea gets up will be given a ringside seat via this blog. Posts will feature a top-shelf team of theatre practitioners at various stages of their careers through images, interviews and clips. I first had the idea to commission a contemporary playwright to respond to Buzo's iconic Norm and Ahmed in 2007 and it's taken me two years of hard yakka to see it come to fruition. I wanted to bring new audiences to my father's work and plant it firmly in the present with a view to the future. I'm also aiming to create a bit of a "through line" for Australian theatrical heritage, now that we've got some history behind us. Cultural amnesia is a common affliction in Australia, I've discovered. Perhaps this is the antidote? We'll see. Norm and Ahmed is an encounter between a white Aussie "bloke" and an articulate Pakistani uni student, inspired by an incident Alex witnessed in the uni bar at UNSW in 1968. It's about racism and generational tension, with the premise "never underestimate the power of difference." I decided to commission Alana Valentine to write the companion play as she told me a captivating story about the opposition a young Afghani Australian Muslim woman faced when she told her own family she wanted to wear the headscarf. We don't often hear of diversity within an ethnic community. 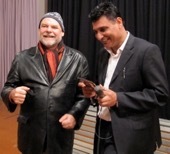 Since 2007, Norm and Ahmed has become a NSW HSC Drama text, and together with reports of racial bashings perpetrated against international students at Australian universities plus the ongoing dialogue about the wearing of the headscarf...that's one prophetic idea! The snappiest way to see whether the latest blog post interests you, is either to sign up for RSS feeds or follow The Alex Buzo Company on Twitter.